I've been in the mood for sweets lately, and I love lemon. And nothing says summer more than lemon, amirite? A friend of mine gave me a tip the other day for making cookies using cake mix. I thought it was a perfect shortcut, so I grabbed a box of Betty Crocker lemon cake mix while I was shopping. And since I've had this glaze bookmarked for a while, I topped them off with that to make them more sugary fancy. 2. In a medium bowl, mix together the eggs, oil, and cake mix. If you have trouble mixing by hand, add a couple of water. 3. Roll tablespoon-sized amounts of dough in your hands to form balls. Place on a cookie sheet lined with parchment. Evenly space them so that you can fit 12 on the sheet. 4. Bake for 12 minutes, or until you can see a little but of light brown around the edges. Try not to let them get too dark. 5. 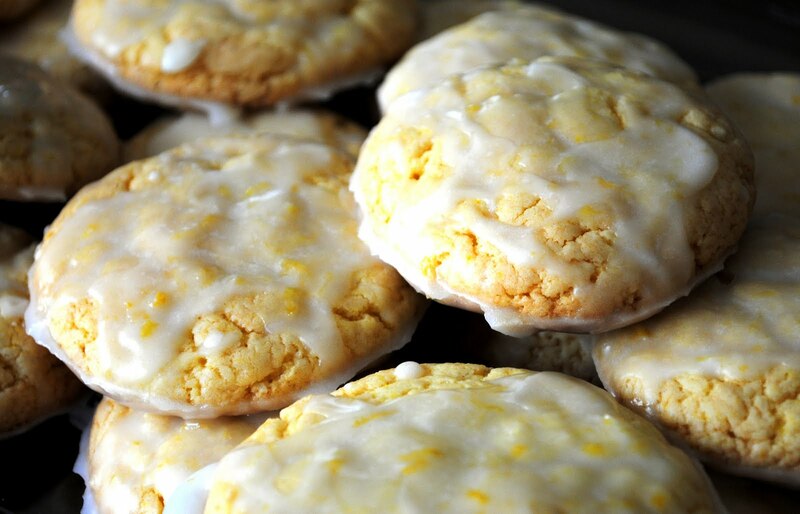 Make the glaze while the cookies cool. Glaze as desired. You'll have plenty left over so be as liberal with it as you like. I made 24 cookies, and had a little dough left over. Only five outfits, but getting better! Friday was a big cleaning day, so I stayed in pajamas. Saturday I was super sick (fever and everything!) so I stayed in pajamas. Sunday - still feeling sick here. But I figured I could show that I at least changed out of pjs....sorta. Tuesday - this is much more close to the everyday me. Pretty boring, but it's my comfort zone. I guess I'm trying to break out of this...looking for practical solutions to the jeans & tee-shirt comfort zone. One of our best friends is celebrating a birthday today, and it's unfortunate that neither the husband nor I are able to attend the festivities. In lieu of our presence, I thought I'd prepare a fun treat for the birthday boy. I chose this particular treat because it's a special drink that our little group of friends always made sure to enjoy every time we went out. These cupcakes are based on the Irish Car Bomb, whose name I am sure is offensive to some (sorry about that!). For those that don't know what this is, it's a "bomb" drink (a shot of something is dropped into another something and then you drink it as fast as possible) which consists of Guinness with a shot of some mixture of Jameson Irish Whiskey and Bailey's Irish Cream. See, it's Irish. And just in time for St. Patrick's Day. Slainte! I adapted my mine from the version Deb made on Smitten Kitchen. I used boxed cake mix and increased the liquor. Because hey, the birthday boy has plans for his party, and none of them involve being sober. And that's why, ladies and gents, we are calling them "bar worthy". 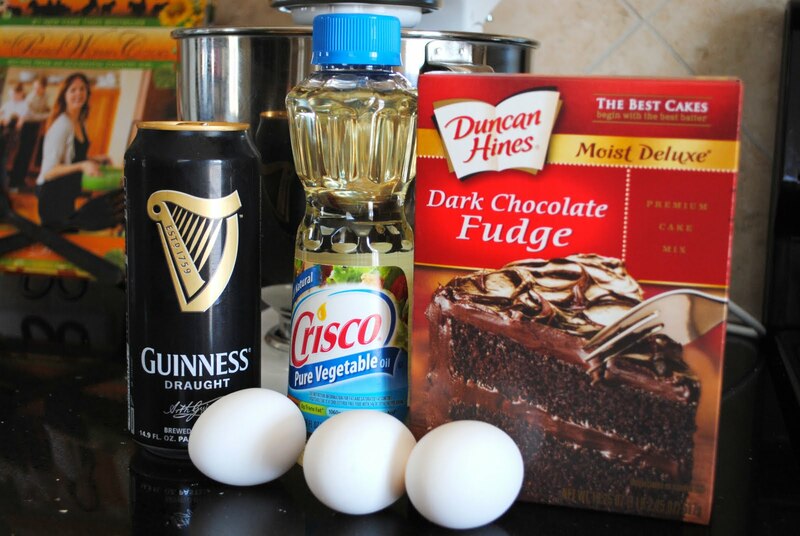 Start by preparing the cake using the package directions, only instead of water, use the Guinness. If your box says to use a different amount of water, do so (with the Guinness of course). Bake as directed, rotating your pans halfway through. Allow the pans to cool on a rack (or be like me and use the burners of your gas stove - off of course). Then transfer the cakes to the counter on a tea towel. 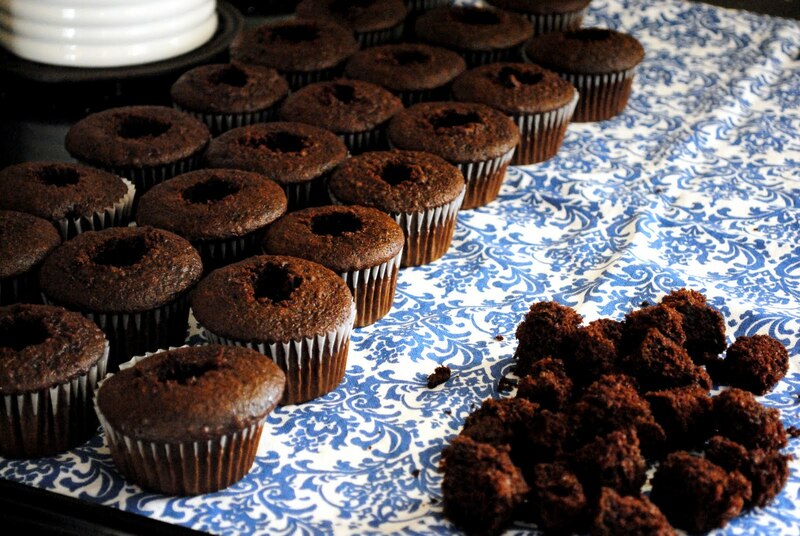 While the cakes are cooling, make the filling. 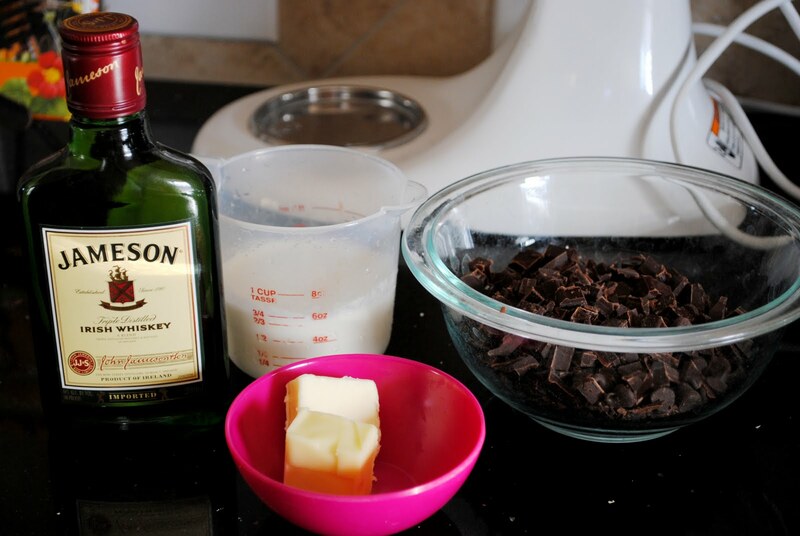 Place your chopped up chocolate into a glass bowl. Heat up the heavy cream on the stovetop over low heat until it simmers. I'm a bad example and have a sadly stocked kitchen, so I used a non-stick frying pan. It did the trick. My (one!) pot is way too big for this task. 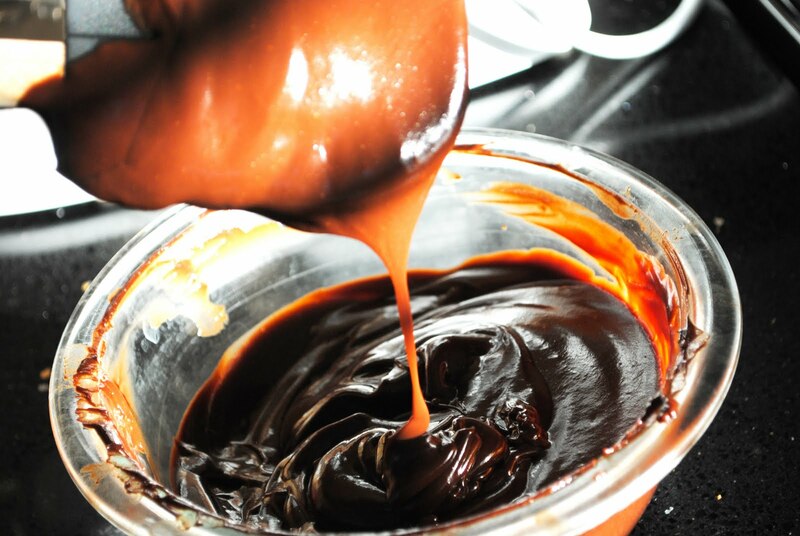 Once heated through, pour it over the chocolate in the bowl and leave it alone. Walk away! Deb says to let it sit for a minute. That worked for me. I actually set the timer because I'm pretty impatient. Stir it around (finally!) to melt the chocolate and get it all nice and incorporated. Then stir in your butter (I had to smash it against the side of the bowl with my spatula) and your whiskey (add it a little at a time and taste as you go). If it's warm, let it sit to cool down. Mine wasn't warm. While waiting for the ganache filling to cool, go back to your cakes. You're going to cut some little holes to put your filling in. 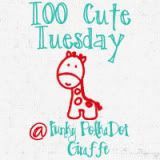 You could use a tiny round cookie cutter (1 inch) or an apple corer. I got all crazy and used a vegetable peeler. Then pipe it into the hole, right up to the top. 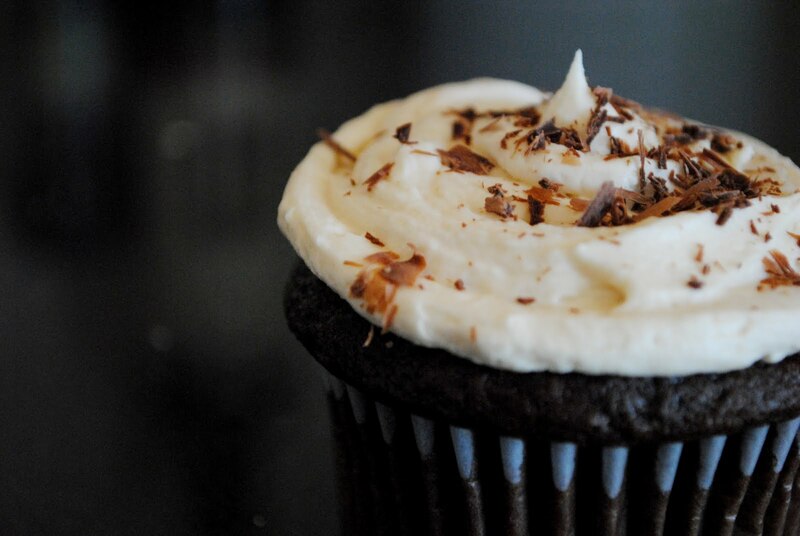 Make your frosting by whipping your butter until it gets fluffy. Add the powdered sugar, bit by bit (it got all crumbly on me at this point, almost like a pie dough). 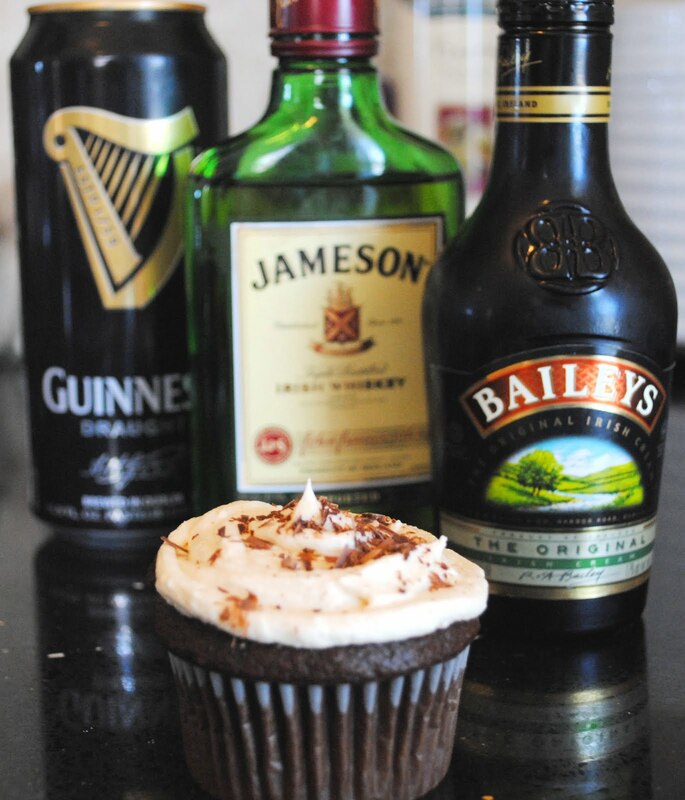 Then add in your Bailey's. Add it in a tablespoon at a time, tasting as you go. 8 tablespoons is A LOT, but that's what I was going for, with the birthday boy in mind. I piped on the frosting with a round tip and then sprinkled on some chocolate shavings. There you go. 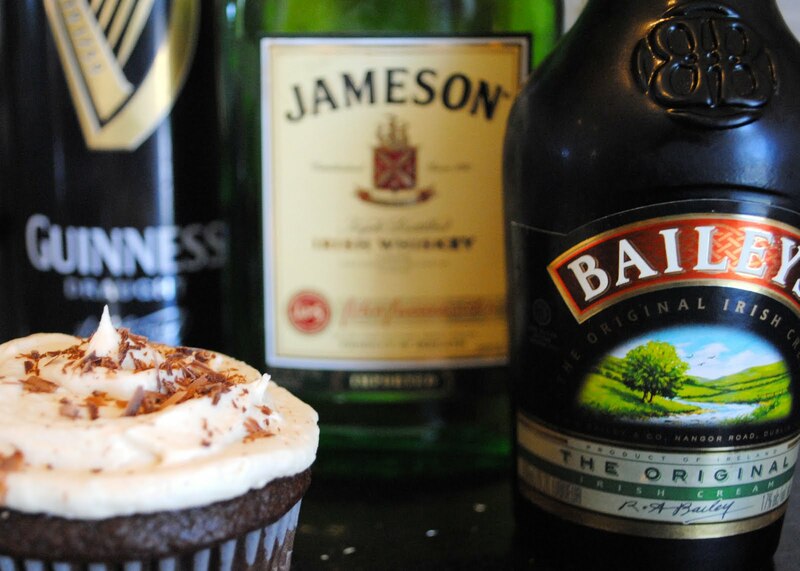 Now comment on how offensive this is because I named the cupcakes after the cocktail they're named for. Not really. You can go read most of the 500+ comments on Deb's post if you want that kind of drama. Sunday March 6 - did some Targeting with my little guy. Monday March 7 - no pic for this day. I changed my clothes way too much while cleaning out my closet. I did start off with black yoga pants and a black tank though, both from Old Navy. I love fabric flowers. On hair clips, head bands, pins, you name it. I'd probably bankrupt my family if I was left alone in a room with a credit card and Etsy. Okay, not really, but you get the idea. I finally decided to just make one for myself. I had all most of the materials. I improvised a little. So I did it, and I couldn't be more pleased. I didn't use a tutorial, I just did what I thought was the way it should be done, based on the materials I had. Not sure if it was the correct way or not, but I think it works! Here I am wearing it. I made the camera strap slipcover too! I love the gray ruffles. What do you think? Etsy worthy? 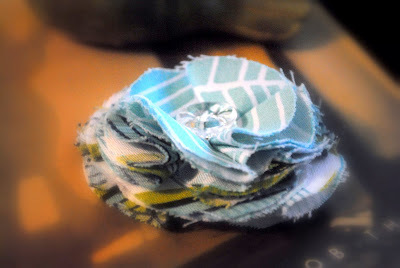 Also, eleventy bajillion internet points if you can guess which vital crafter material I do not own. You will gasp when you find out. Project: Simplify: Organize Your Closet! 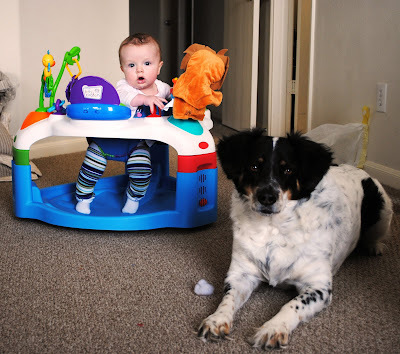 Are you following along with Simple Mom's Project: Simplify? If not, head on over there and get started! Week 1 started today, so you've still got plenty of time to get busy. The first Hot Spot was revealed today. Time to get cleaning and pare down that wardrobe. 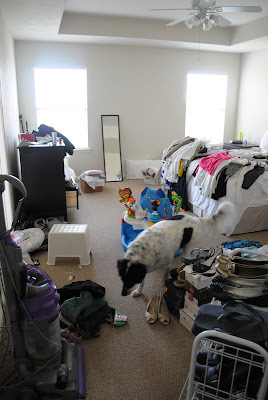 I started off with a pretty messy closet. I can't stand going in my closet. The way the door opens is awkward, and my husband's half is just UGH. I won't even show pictures of it. But it's his stuff and I'm respecting his space (though I will be nudging him a little to get it tidied up). I followed the suggestions given to attack the mess. I tried on EVERYTHING. Yes, all of it. It was quite an eye-opener. You see, I've recently had a baby (he'll be 6 months old in two days! 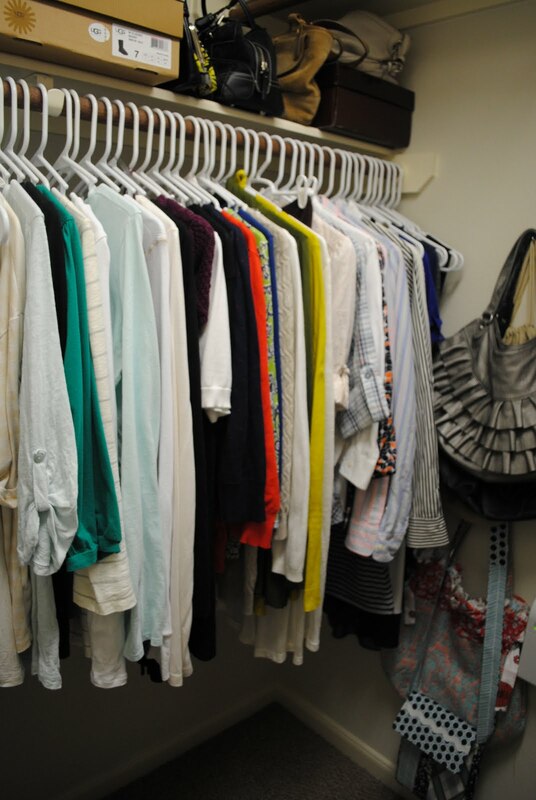 ), and before I got pregnant I was already dissatisfied with my wardrobe because I had gained a few pounds. I was certain I wouldn't have anything left in my closet. I was thinking none of my clothes were going to look right anymore. But they did! I don't know what happened, because a lot of my better clothes looked great on me. I even need to take a few things in to get tailored. 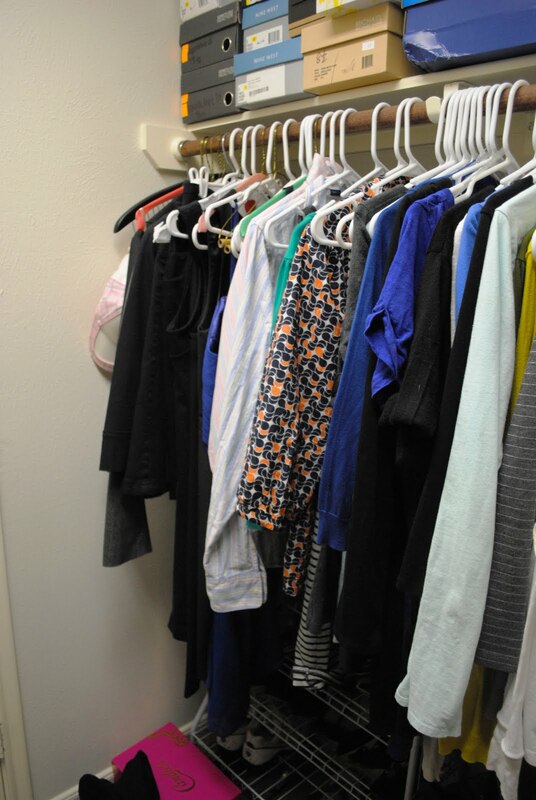 Here's a tip for the clothes you don't want to keep: take them off your good hangers and reuse old dry cleaner and store hangers to hang them up. I'll be selling them at a garage sale, so I want them to look as buyable as possible - which is not piled in a box. Reuse those dry cleaner hangers! I just want to lay down on this empty floor! -Make sure all the clothes are facing the same direction. 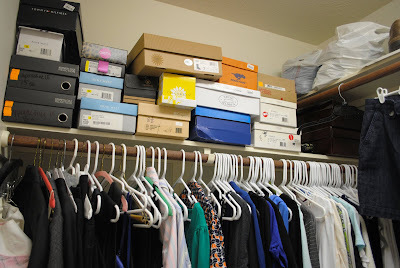 I walk into my closet from the left side, so it made sense for me to face the left side of my closet. If I had a rod that was straight in front of me (say I had a sliding closet door and not a walk-in) then I'd probably have them face the right side since I'm left handed - I'd be picking the item up with my left hand so the front would still be facing me if it faced left. Does that make sense? 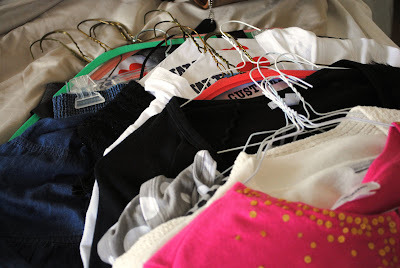 -Use the same hangers throughout. This is an inexpensive way to make the closet look more streamlined and organized. My mom has fancy wooden hangers that she purchased little by little. I have simple white plastic tubular hangers with the little notches. 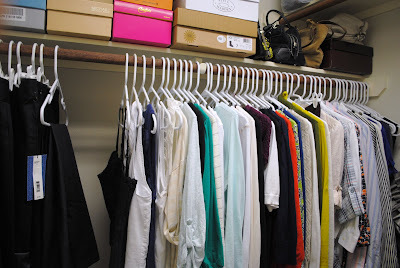 -Use the correct hanger for the garment. Skirts stay pretty and pressed when hanging from the little skirt hangers that match my other hangers. 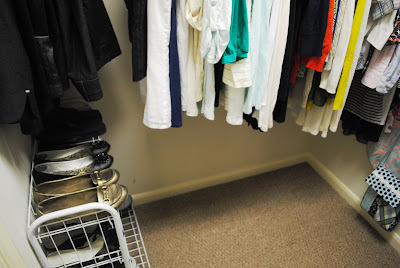 -Try to keep a little bit of space between each garment. It's probably good for them to have some air circulation, plus an even space between each hanger just looks sharp on the rod. -Keep like items together. I used to organize by color. That looks great and all, but that doesn't work for me anymore. Think about how you get dressed. Are you only concerned with color? If so, then organize that way. For me, however, I want to pick my pieces based on the weather. It changes at the drop of a hat here in the Houston area, so I always have a variety of season's worth of attire. So I keep sweaters with sweaters, tees with tees, blouses with blouses, and tanks with tanks. 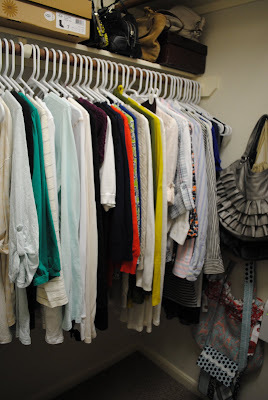 For the garments with sleeves, I like to sub-organize by sleeve length. So far that's what works for me. 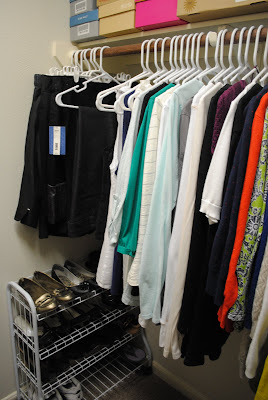 -Store extra hangers in your laundry room. 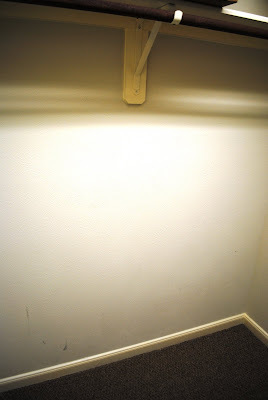 I have a hanging rod in my laundry room, so all the empty hangers stay on that. When the clean clothes come out of the dryer, they get hung up immediately instead of getting piled on the bed or dresser (or dog crate in my case). It feels great to have the closet cleaned up, and now I'm actually looking forward to getting dressed tomorrow. 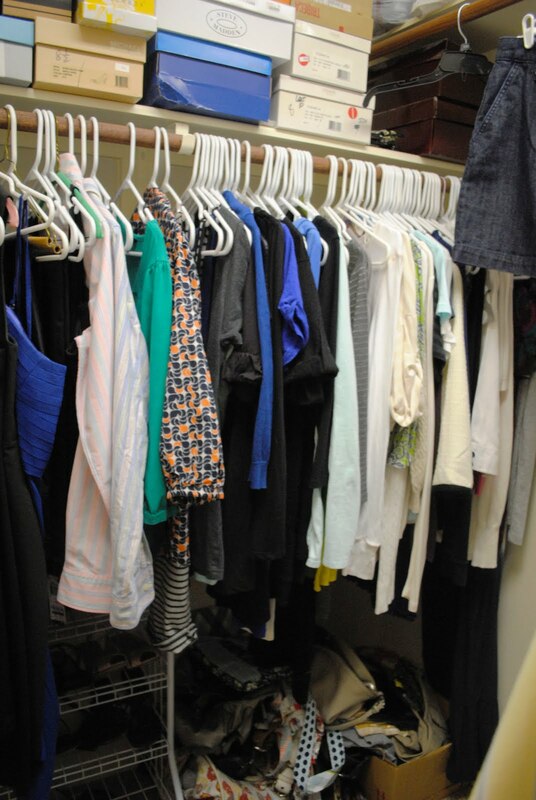 Look at all those clothes I have! And they all fit! And I can find them! It's like I just went on a shopping spree or something. Thanks for the motivation, Simple Mom! Leave me alone, I've been busy...doing...er...well, I've been busy just living life I guess. 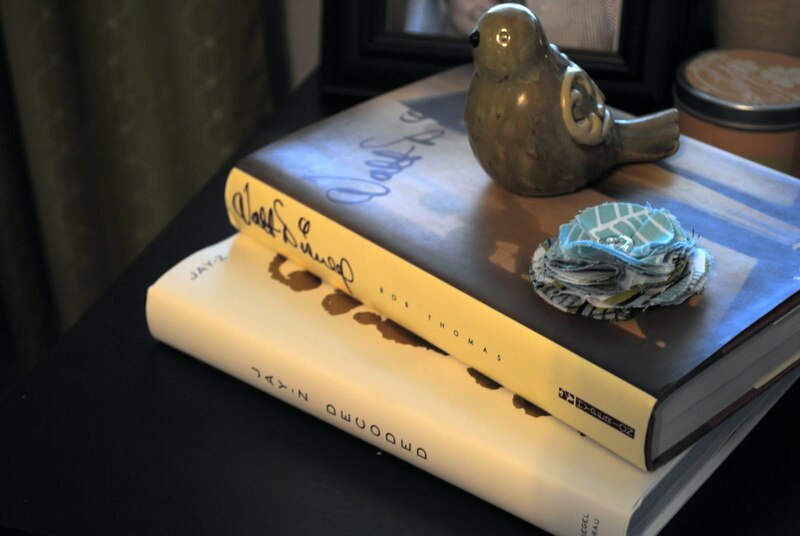 I hadn't felt compelled to blog about anything, so I just didn't. On the menu this week! Thursday - Going out for Crawfish!! Yum yum yum. You can contact me through email at kristan anne 19 at aol dot com. I answer all emails promptly!